In this war, facts and evidence matter. Its a war of narratives. One narrative is based on facts and evidence. That is what UTT specializes in. Last Tuesday, UTT’s President John Guandolo and Vice President Chris Gaubatz testified before the Oklahoma State Judiciary and Civil Procedure Committee’s Interim Study on “Radical Islam, Shariah Law, the Muslim Brotherhood and the Radicalization Process” called by Oklahoma State Representative John Bennett, a combat veteran Marine in two wars in Iraq and Afghanistan. The UTT team laid out the evidentiary framework for the jihadi network in the United States, and explained that sharia is the basis for everything the jihadis do. Watch a clip of Chris Gaubatz’s testimony HERE. Watch a clip of John Guandolo’s testimony HERE. 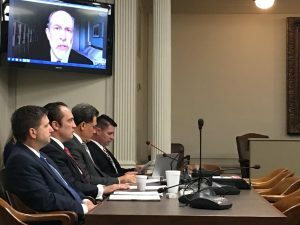 Others testified as well including Stephen Coughlin and Frank Gaffney via skype, and a former Muslim who went undercover at the Islamic Society of Greater Oklahoma City. 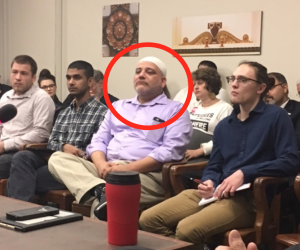 Additionally, former jihadi Kamal Saleem, Michael Hoehn who works with the counterterrorism caucus, and courageous pastor Paul Blair from Edmond, Oklahoma also testified at the state capital. 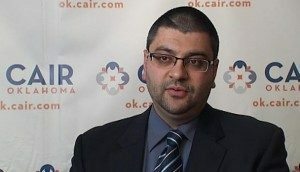 As was expected, the media in Oklahoma disregarded the evidence and ran to the aid of Hamas leaders like Adam Soltani, leader of CAIR Oklahoma, and Imad Enchassi, the Palestinian Imam of the Muslim Brotherhood’s Islamic Society of Greater Oklahoma City. The lack of state legislators speaking out and standing by Representative Bennett is noticeable. Only three, including Representative John Bennett and the Chairman of the committee, were present for the hearing. When UTT says Sheriffs and Pastors are the two most important groups of people in this war, this is a great example. Pastors because citizens must be engaged in this issue. Now is time for citizens of Oklahoma and everywhere else to stand firm and not give one more inch to our enemies. UTT encourages all its readers to contact the Speaker of the Oklahoma State House and let him know there is a war going on and he needs to grow some courage and stand by combat veteran and OK Representative John Bennett to send Hamas packing. Robert Spencer wrote an excellent piece in Front Page Magazine about the hearing HERE. In 1993, the FBI was aware that 20 American Muslim members of Hamas met in Philadelphia for an important meeting. CAIR was born as a result of that meeting. What this group didn’t realize was that the FBI was aware of their efforts and listening in to the discussion. That began a 15 year investigation which ended with Holy Land Foundation Trial in the Dallas Federal Court in 2008. It was proven in court and declared as true by the Department of Justice that the Council on American Islamic Relations (CAIR), the Islamic Society of North America (your local mosque and imam), the Muslim Student Association (MSA), the North American Islamic Trust (NAIT) and others were branches of the Muslim Brotherhood operating in America in a joint effort to raise money to support terrorism, and settle vast numbers of Muslims in America, not to assimilate, but to eventually bring down the Constitution and integrate America into the larger global caliphate. CAIR, ISNA, MSA, NAIT and others ARE HAMAS operating in America. This is all fact, proven in Federal Court by the Department of Justice and the FBI. Unfortunately, Barak Obama was elected in 2008. As the Holy Land Trial was coming to a conclusion, a new Department of Justice was being put in place – and these prosecutions have ended. Nevertheless, the facts still remain and have been proven in Federal Court. CAIR, ISNA, MSA, NAIT and others ARE HAMAS operating in America. Why would any person knowingly wish to work for an organization that was tied to Hamas unless they agree with the philosophy of that organization? Would you work for the NAZI party? Of course not. Would you work for the KKK? No. Obviously these men who are a part of these organizations agree with the mission of the organizations. This is the obvious conclusion. All of us wish to believe the best in others. However, there is evil in the world. Emotions will lie to us. We must follow the FACTS wherever they lead us. Thank you Rep. Bennett for courageously stating the facts. You can’t fight foreign propaganda and invasion when truth is suppressed and made illegal by corrupt politicians and foreign/political entanglements that are protected by faux civil rights and distortion of laws. I.e. the new issue of “Nashir-Media Foundation’s” magazine, published in Arabic, English and French, is today urging sharia-adherent Muslims in the United States & France, whose good fortune of living “among the enemy” is thus conducive to successful “lone-Wolf” lethal jihadist attacks, to immediately embark on a vengeance-driven homicidal rampage in both countries, in retaliation for ISIS losses in Mosul. Furthermore, if the Muslim community – particularly the professional violence-inciters called “Imams” – were being regularly apprised from every non-Muslim pulpit (or equivalent thereof) in the country, that one’s practice of the “religion” he chooses is only an unalienable right provided it neither disturbs the public peace nor is used to OBSTRUCT or ATTACK others in the practice of theirs – so said America’s founders – there would be fewer demands predicated on the loony-tune belief that Islam is superior in the United States to ANY other denomination involving ones faith, or indeed, a total absence thereof. Its referred to as FREEDOM!